Keep your noggin dry with the eVent cycling cap. 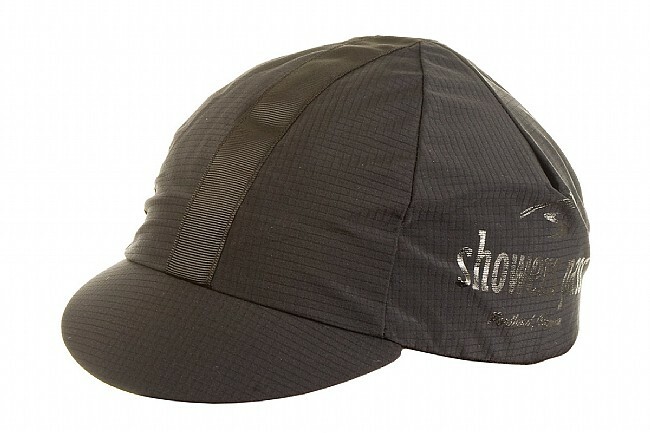 This classic paneled cap is made from eVent fabric -- the same highly breathable, totally waterproof material used in Shower Pass' top-of-the-line rain jackets. A soft and stretchy cotton headband has been placed inside for extra comfort against the skin. The 5cm brim helps keep rain out of your eyes too. Available in Black with cloth center strip and silk screened graphics. One size fits most. Could be good, but too large! I never ended up using this as it fit like a shower cap and decided to exchange it for the Craft version. I have a medium sized head and the elastic held the cap on but it looked too mushroomy. Probably wouldn't be a problem under a helmet but didn't work for me. The material seemed decent and the styling was nice, apart from the aforementioned fit. I went for the Craft rain cap which fits great, folds up, and works in the rain. Awesome cap - but is it worth the money? Works well but needs a more absorbent sweat band. I use this when there is any danger of rain. I wear glasses all the time for dstance so a cap when it is raining is essential. I keep te cap it in the rear pocket of my Showers Pass rain jacket. I use Halo Headbands and skullcaps when it is not raining. I really like their sweatband system. I have used traditional cotton or cotton blend cycling caps which are not waterproof and this cap is better in that respect. This is a stylish waterproof cap. It fits easly under helmet. It's just a little bit on the pricey side! Bought this hat to increase my comfort on rainy day commutes. It fits well, snug and does not interfere with helmet. The visor does a good job of deflecting rain off my eyewear. This cap also wards off an uncomfortable wind chill when the temps are above the 30s. Below that temp I prefer a bit more insulation but rain protection of this cap trumps the extra warmth of a fleece cap. I ride in the dark frequently and an under the helmet cap allows use of lights on my helmet which a helmet cover would not. Best solution for nasty weather riding - a tad on the expensive side, but worth it. It's breatheable and waterproof - really! Fits nicely under your helmet without having to remove pads. Perfect for those days when it's rainy in the morning and nice in the afternoon - your helmet fits with and without the cap. As with all cycling cap, the bill is used to keep rain and debris out of your eyes in nasty weather not condusive to lenses - which fog and splatter. Keeps your head warm and dry, keeps the raindebris out of you eyes. Superior to a helmet cover and protective lenses in nasty weather.